This SM58 can add some dirt to your sound. In 2007, Swedish magazine Studio asked a simple question: is Shure's SM58 the world's toughest microphone? What's more, they attempted to find an answer by subjecting an SM58 to all manner of abuse. 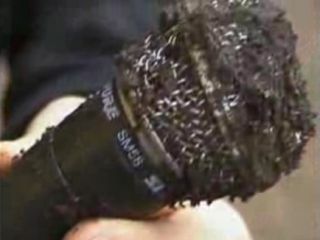 The mic was used as a hammer, dropped on the floor, frozen, submerged in water and even driven over by a car… but it still worked, as this video clip proves. Now it emerges that the SM58's suffering wasn't over: the Studio team buried it in the ground and left it to endure rain, snow and freezing temperatures. Now they've pulled it out of the ground, washed it down and tested it again - check out the video below to find out if it still works.